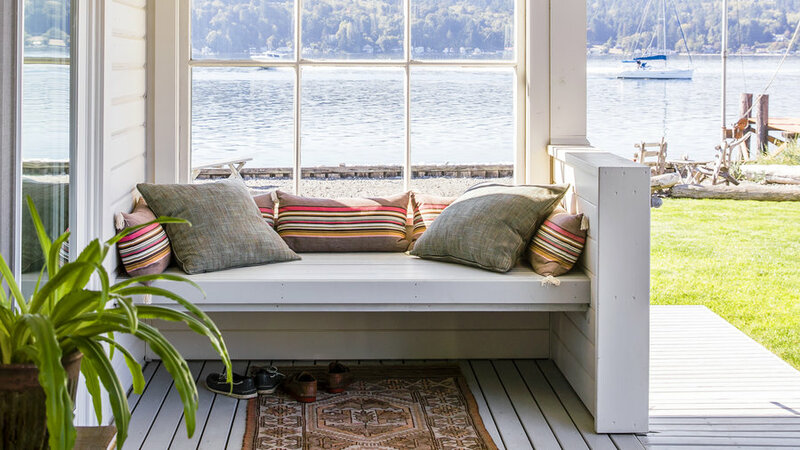 When designer Tim Pfeiffer and his partner, Matt Carvalho, stumbled upon this 1890s house after years of searching for a vacation home on the island, the place had become, in Pfeiffer’s words, a “barnacle colony”: A hodgepodge of decorative eras, with peeling linoleum flooring, shag carpeting, multiple roofs, chipped paint, and pink plywood walls. 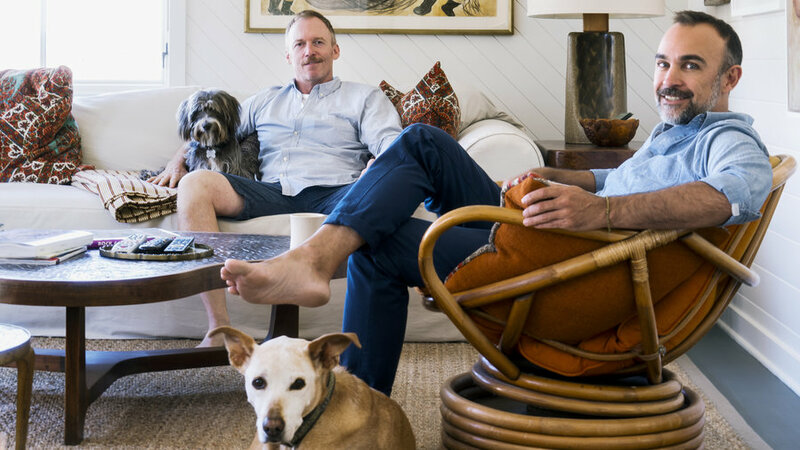 But over the course of a year, Pfeiffer spearheaded a gut renovation of the roughly 1,900-square-foot home. 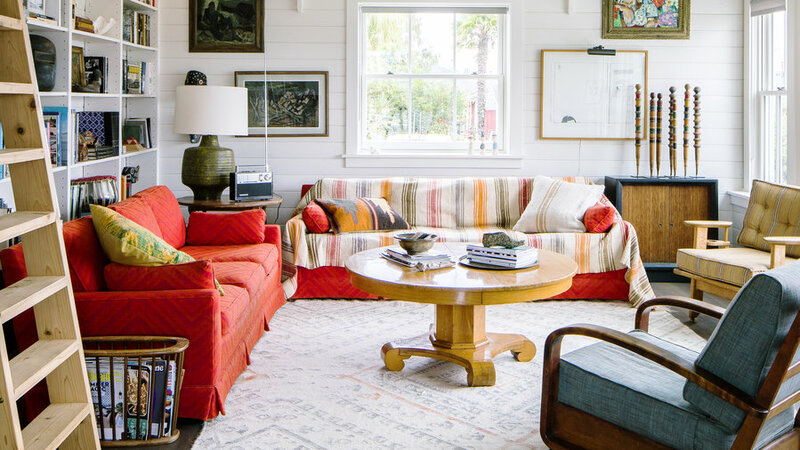 The result is a design that’s timeless and—at last—cohesive. 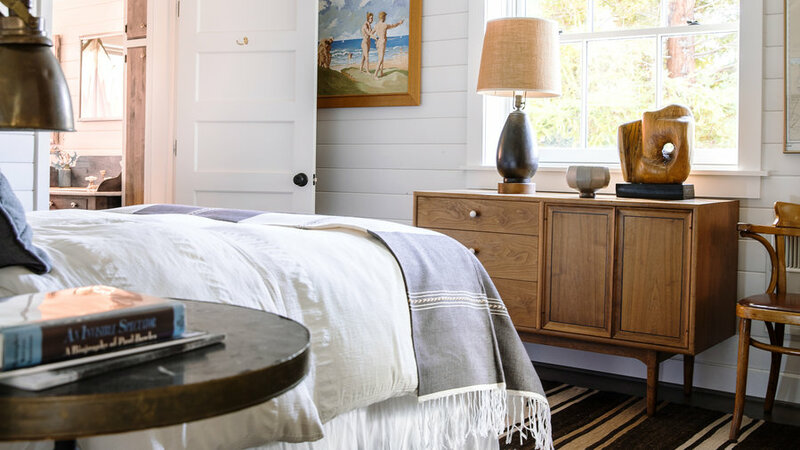 White cedar-paneled walls, Douglas fir floors, and salvaged doors and fixtures form the design’s backbone. “We’re giving the place back its historic character that’s been stripped away,” notes Pfeiffer. Follow along to see how to achieve the look. 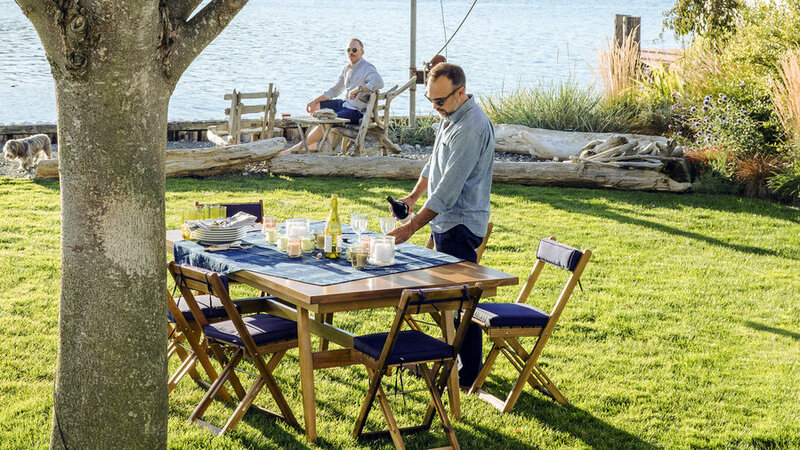 Pfeiffer built the extra-long dining table with his father 17 years ago out of salvaged barn wood. Today it serves as the spot for family gatherings. 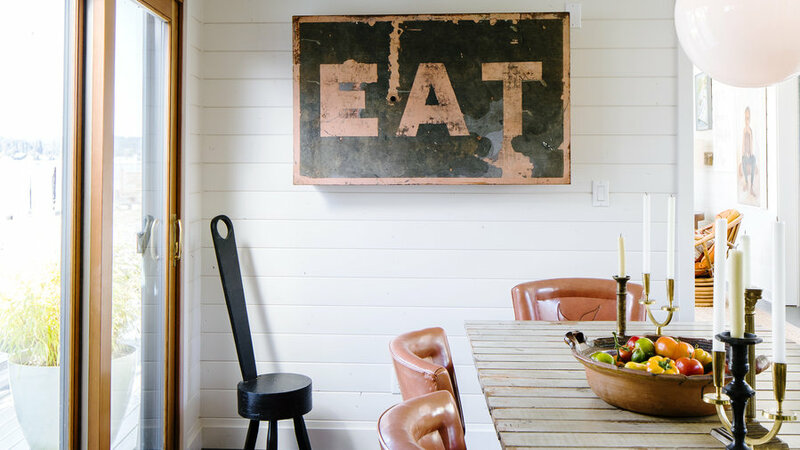 The EAT sign, found at Kirk Albert Vintage Furnishings in Seattle, echoes the table’s weathered look while adding personality. 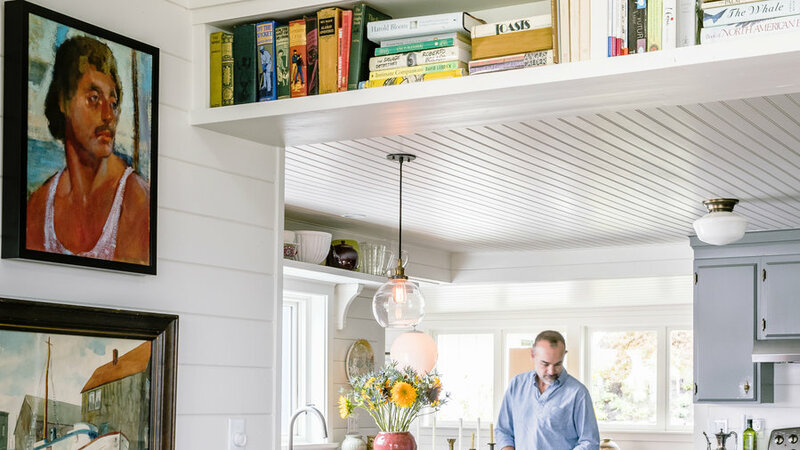 In the kitchen, Pfeiffer retained the cabinets that were installed in the 1950s, painting them a gray-blue hue that felt nautical and true to their mid century roots. Aged brass hardware plays up the sea-captain vibe. For the new countertops, he opted for Formica, a nostalgic nod to old beach cottages. Used as a fishing shack for years, the cottage had an awkward layout full of dead ends and even lacked private sleeping quarters. By tearing down almost all the walls and rethinking the layout, Pfeiffer and Carvalho gained three separate bedrooms, including the master. The master bathroom, which previously included a pink tub and a plywood-Paneled shower, was completely transformed. 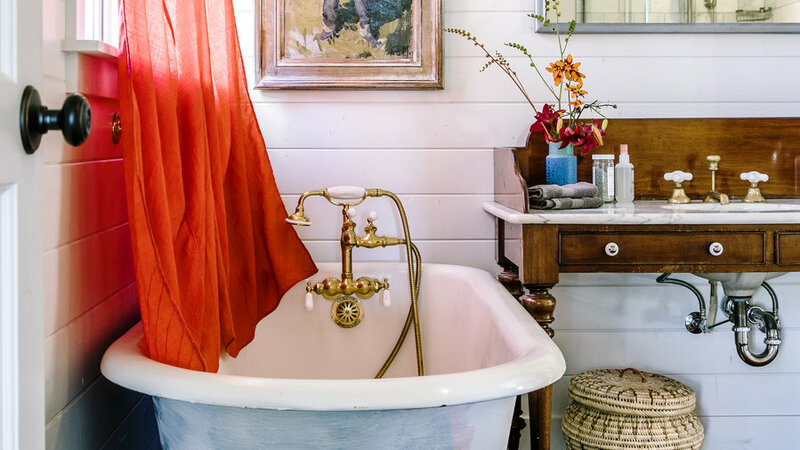 A soaking tub was a must-have for Pfeiffer,who likes to warm up after boating and paddleboarding.He unearthed the circa-1920s tub at Second Use in Seattle, which was also the source for the reclaimed doors and fir floors throughout the home. A pair of signal flags found in Provincetown serves as drapery. Growing up, Pfeiffer’s family regularly celebrated holidays at his grandparents’ beach house. Now his and Carvalho’s home has become that destination. During the Fourth of July, their families gather to barbecue outside and watch the fireworks over the water.